First Nations President Michael Roberts opens the conference and introduces the first keynote speaker. In early October 2013, First Nations held its 18th Annual L.E.A.D. Institute Conference at the Mystic Lake Casino Hotel in Prior Lake, Minnesota, at the Shakopee Mdewakanton Sioux Community. 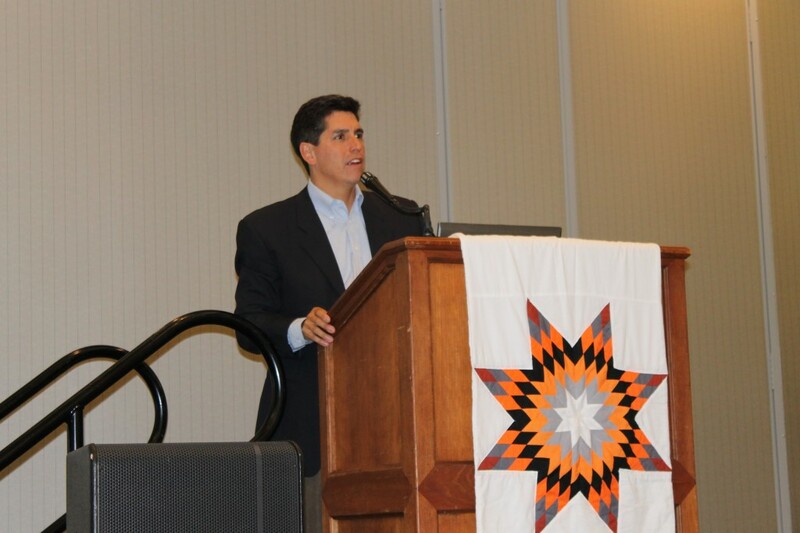 It attracted a record number of attendees – almost 200 – who journeyed to the event from numerous Native nonprofits, tribal governments, businesses and other entities across the U.S. It also attracted foundation and corporate executives, many of whom presented at workshops or on panels during the conference. 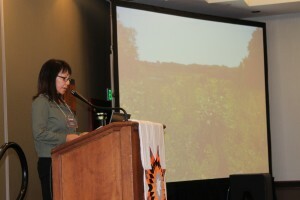 Lori Watso of the Shakopee Mdewakanton Sioux Community talks about renewable energy and sustainability efforts. Although the group was diverse, they all shared one common purpose: they are deeply interested in building, rebuilding, growing and improving Native American communities and economies. This is a purpose that aligns directly with First Nations’ own goal and mission. L.E.A.D. stands for “Leadership and Entrepreneurial Apprenticeship Development” program. It is a First Nations effort designed to provide training, mentorship and networking opportunities to emerging and existing Native American leaders and other professionals, particularly those engaged in nonprofit work but also for those involved in Native businesses and governments. The conference kicked off with intensive pre-sessions that included the areas of agriculture and Native food sovereignty, financial capability, and urban Indian programs. Co-sponsors of these pre-sessions included the Shakopee Farm, Intertribal Agriculture Council, Northwest Area Foundation and The Kresge Foundation. The pre-sessions ended and the main conference began with a networking reception sponsored by Comcast|NBCUniversal. The Funders Panel draws lots of interest and questions. The next day and a half featured keynote presentations and breakout workshops on a variety of topics related to First Nations’ focus areas of asset-building, nonprofit capacity-building and Native food systems. Among the keynote speakers were Lori Watso, secretary/treasurer of the Shakopee Mdewakanton Sioux Community, who spoke about some of the tribe’s renewable energy and sustainability initiatives; and Bill Black, vice president and executive director of the Comcast Foundation and director of community investment for Comcast Corporation, who addressed why and how his company is supporting organizations in Indian Country. The breakout sessions covered areas such as marketing, communications and social media, financial and investor education, good agriculture practices, nonprofit incorporation and board development, Native food policy, and financial management. 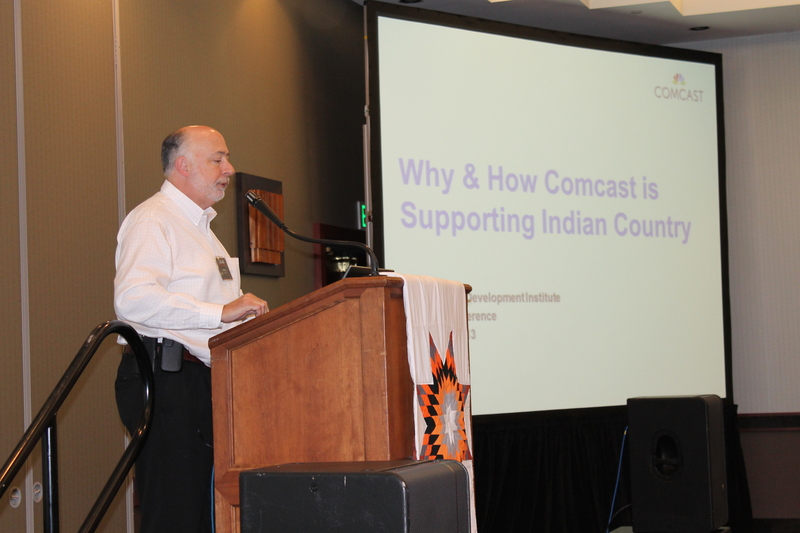 Comcast Foundation's Bill Black keynotes about why and how Comcast is supporting Indian Country. 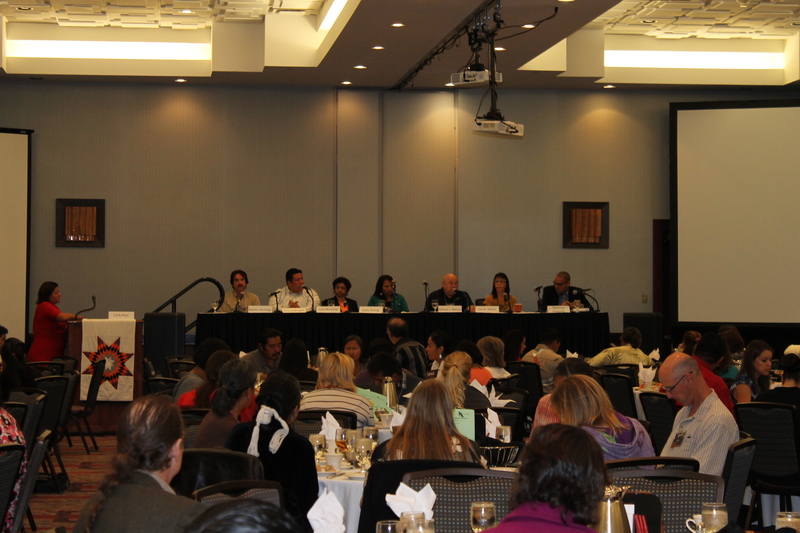 The conference ended with the ever-popular Funders Panel comprised of representatives from foundations that support Indian Country. They provided insights, guidance and tips on dealing with their foundations in seeking support for projects and initiatives. Panelists included representatives from Northwest Area Foundation, Otto Bremer Foundation, CHS Foundation, Bush Foundation, Margaret A. Cargill Foundation, Shakopee Mdewakanton Sioux Community, and First Nations.